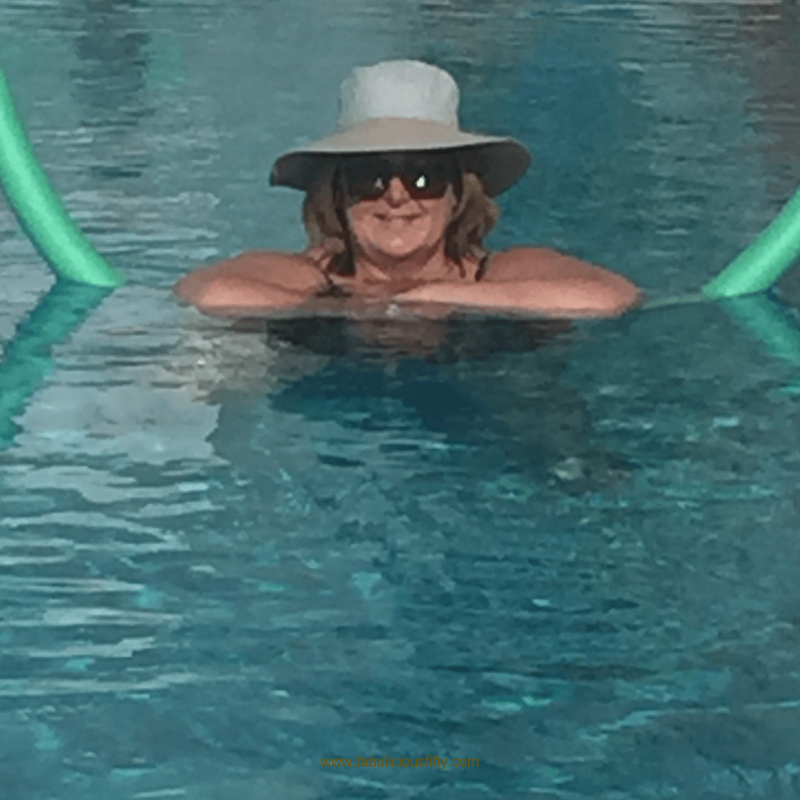 Marmaris, Turkey – the Friendliest Place! 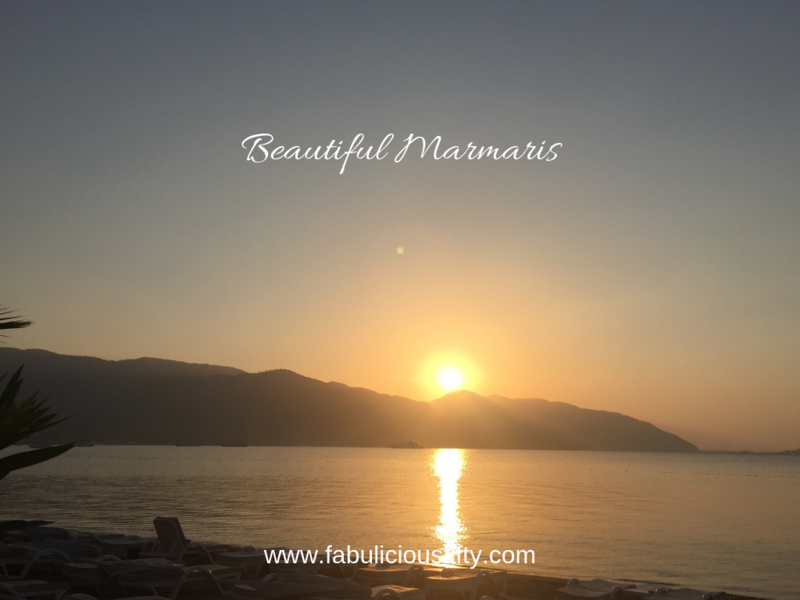 Our recent trip to Marmaris in Turkey was literally a tale of two parts. The good however significantly outweighed the bad. Almost 5 hours on a budget airline is tiring. It was wonderful to land at the brand-new airport at Dalaman and to feel the sun on our shoulders. The transfer system here is very slick, and we were soon installed into a smart little mini bus, complete with a cooler of drinks. All the transfer buses stop off half way, and I was delighted to stretch my legs and treat myself to my first Turkish ice cream – it was called blue sky – and looked exactly like the sky above us. I was curious to try it and wondered what it would taste like – hard to describe but the closest I could get was caramel delicious. Before we arrived at our hotel we knew it wouldn’t be great. We had been doing some research on Trip Advisor and were a little worried to be honest. The reviews were shocking. We already knew that it was a five-story hotel that had no lift. When I found this out I called ahead and explained my mobility issues and thankfully we were in a room on the first floor. The hotel was very run down, but thankfully clean (this is important to me). We had also booked full board – and one look at the dining room, the food that looked like it was recycled for each meal, and the kitchen led us to a quick decision that we wouldn’t be eating in. On the plus side the location of the hotel was perfect, only 5 minutes from the beach, with easy access to the town and lovely eateries. It also had a great rooftop pool, that had me taking a daily dip! It is important to check things out. We do travel on a budget, so were not expecting 5 stars. The food in Marmaris is amazing. Let me just say that. From a gorgeous Cappuccino to a full mixed grill, everything was fresh and delicious. It was also extremely affordable, and served with a smile. The first morning we went for a walk along the seafront. After a while I was hot and tired, so we chose a restaurant for a refreshing drink. Vamos appealed to me from the sidewalk, and it was a good choice. Although we were only having a drink, I read the menu (I always do this – its ok to dream). I noticed a starter of watermelon and feta and never mind that it was 11am I ordered it. The portion that arrived was enough for three! They quickly brought extra utensils and told me that this was not the normal portion size but that they decided to treat me. It was fresh, juicy and so delicious. And, it set the tone for a foodie holiday. A firm favourite on the Turkish menu was lava bread. This is literally a balloon of bread – crispy and light served with salsa, garlic yogurt and garlic butter. I think we shared one every day, and I am missing them already. Food was so affordable and the quality was outstanding. 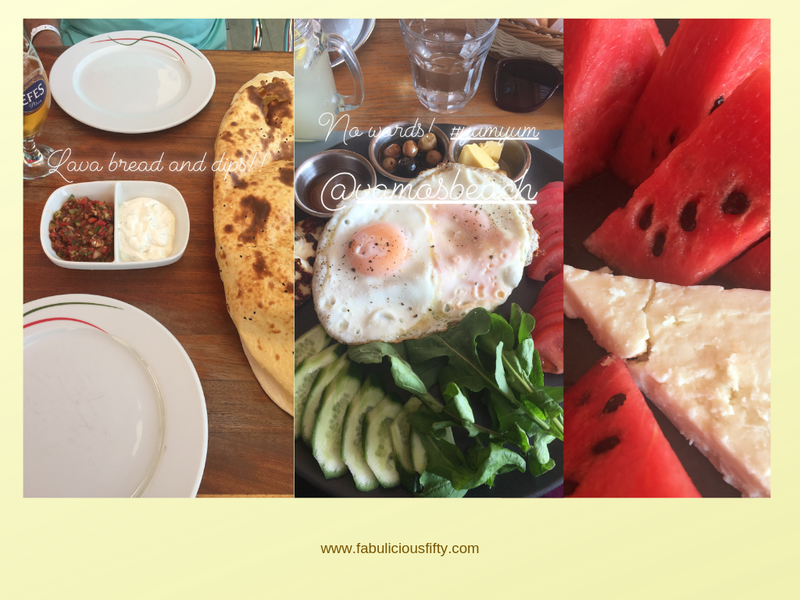 We indulged in gorgeous kebab skewers, the most delicious pizza, and tasty gorgeous Turkish breakfasts. If you fancy, there is always a great English breakfast – available in most restaurants. I had underestimated how much spending money we needed – primarily because we ate out all the time. After one attempt at drawing cash from a Turkish language ATM which was stressful, we realised that it was easy enough to choose a multiple language version. By this stage I thought I was accustomed to the Turkish Lire. I had bought three pairs of Birkenstocks, and we had tried out all sorts of treats from the supermarket. I drew a couple of hundred lire, and then realised that it was barely 30 Euro. Your money goes a long way in Turkey. We booked our budget trip with Love Holidays. We love to walk. Even though I walk slowly and with my trusty stick Stan, I am game to see how far I can go before I need a rest. One day we decided to visit the next village – Icmeler. I am not sure why we thought we could walk there, but we did. We walked and walked. I got hotter and more tired, and started complaining. Himself kept on saying, it’ll be around the next corner. After about six or seven corners I called time and we popped into a café with a Wi-Fi sign for a cold drink. I checked google maps – it was 8km further!!! Suffice to say we went back to the hotel for a swim and took a taxi the next day. I fell in love with Icmeler, bought the most delicious Turkish delight and indulged in yet another Lava bread. I had heard about a Hamman – a Turkish bath. Feeling brave I booked in and descended the stairs to the Hamman spa. Now, please remember that I am fabulous plus sized lady. I was shown the changing room and offered a Turkish towel which is probably slightly bigger than a large dish towel. I blanched! A young lady came to assist and managed to truss me up in two towels – I had elected to keep my underwear on (for now). After a sauna, I was shown into the Hamman room and invited to lay down on this large marble slab. There was then a confusion of communication and eventually and English speaker came to clarify – did I want a man or woman to wash me. A woman please! This was a great choice as from this point on I realised that I had to simply give up on inhibitions and enjoy the experience. I was given an invigorating aloe vera scrub, followed by a massage with what can only be described as pillow cases full of foam. It was sublime. The experience concluded with a full body (and I mean full body) oil massage. I have shared my turkish bath story with a few people. I have told that I didn’t sell it well. Yes, it is an extremely intimate experience – but I would do it again. Just remember to leave your inhibitions at the door. The bay of Marmaris is extremely picturesque. From the first moment, we glimpsed it on arrival, I wanted to paint the misty hills that enclosed it. The first morning we noticed Pirate ships on the bay, and I was intrigued. There are several ships all offering day trips around the bay. In the end, we chose the Black Pearl, primarily because of the friendly man who engaged with us. I was a little disappointed that it wasn’t a pirate ship, but then again we got to watch the Pirate ships instead. This day out was brilliant value and included all drinks on board as well as a delicious lunch. The views were stunning and so inspiring. 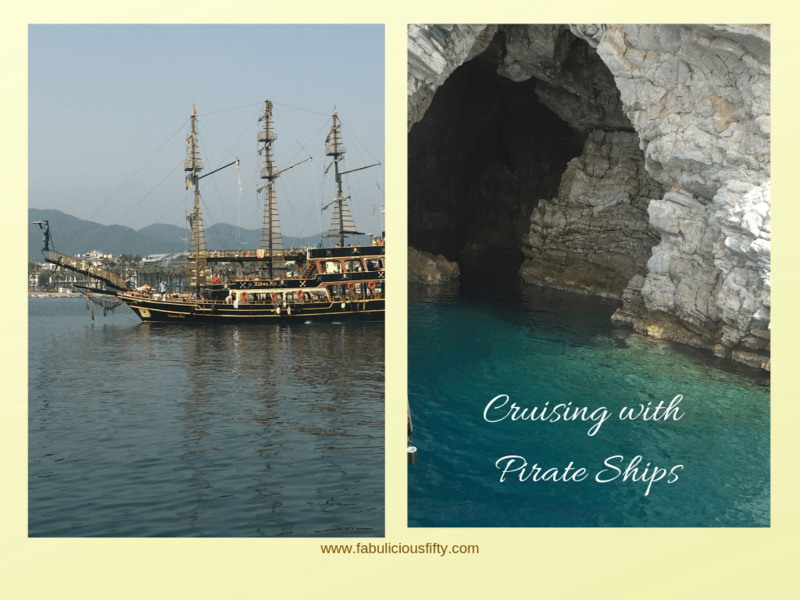 We dropped anchor at various spots for swimming, sightseeing and to view truly magical caves. When I think back on my trip, the overriding memories are of the friendly people, and the kindness of strangers. For the most part, people are honest and kind. We had great chats with locals and other tourists, and felt truly welcomed. We will be back – and next time we will stay in the lovely Icmeler but of course we will visit the beautiful bay of Marmaris. « The best way to start a holiday! I would totally agree the Turkish people are so friendly. You should also consider visiting Antalya beautiful area.